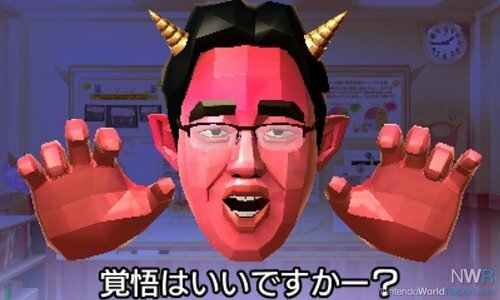 Dr. Kawashima's devilish side is a lot nicer than you think. Brain Age: Concentration Training reboots the series without making sweeping changes. Nintendo hasn’t changed the colour of Dr. Ryuta Kawashima's hair, or outsourced the work to a Western studio. Instead, it’s created a Brain Age game suitable for today's audience. Instead of simply honing your brain to a target age, Concentration Training aims to improve your working memory. As Dr. Kawashima describes it, working memory is the area of the brain that handles temporary information. The game uses a soccer match to illustrate the concept: as players move about the field, those with the ball take note of the other players’ positions and pass accordingly. This isn’t information one would retain for a long period of time, and is used just once. Likewise, the aim of Concentration Training is to improve the player’s focus and to train the brain to avoid distractions. Concentration Training’s Devilish Training exercises differentiate it immediately from previous Brain Age games. Kept to five minutes in length, these eight exercises call on the player to make good use of their working memory. The difficulty is also adaptive; the better you perform, the harder the exercises get. Devilish Calculations, the exercise found in the game's eShop demo, requires players to recall the answer to the math equation previous to the one shown. Scoring 85 percent or higher from 22 questions asked increases the difficulty, first speeding up the procession of equations, then requiring an answer to the equation shown two prior. This system of difficulty involves the player far better than would competing for time or striving for a particular brain age. The game also feels as if it grows along with you, always presenting a challenge. Where you finished on a given day determines the level of difficulty you begin with on the next; there's no climbing from the bottom with each new day. 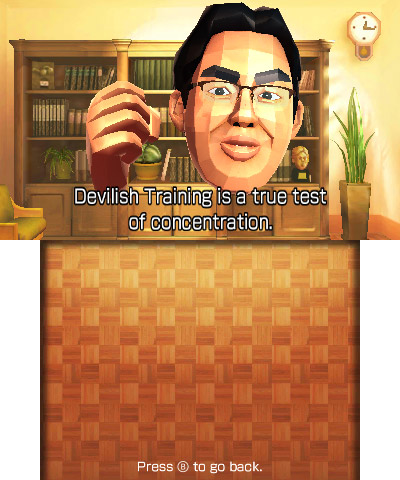 Completion of a Devilish exercise adds to an experience bar associated with your Mii. As you "level up,” the letter grade displayed on your Mii changes in kind. It’s hooks like these that allow for more investment in your performance, with the visual representation helping to gauge your improvement. Although the exercises are capped at five minutes, you can tackle as many as you like (though you can play each game only once per day). Highlights of mine include Devilish Blocks and Devilish Reading. Blocks shows an arrangement of blocks to the player, one of which disappears. Depending on the difficulty, the number of arrangements shown increases or decreases. After a full set is shown, players see the arrangements once again, and must tap which blocks went missing. Devilish Reading tasks players with reading a series of sentences and memorizing the underlined word of each. This exercise employs the 3DS's mic (you read aloud) and prompts you to tap the screen when you're ready to move on to the next sentence. Once you read them all, you write the underlined words (in any order) on the touch screen. Deceptive appearance is a common theme among Concentration Training’s games. These tasks may seem simple at first glance, but prove difficult in practice—as it turns out, remembering five words from five sentences isn't the easiest thing in the world. One knock against the Devilish exercises is that, of the eight, three share the same mechanics. Devilish Calculations, Listening, and Shapes require you to answer a question previous to the one displayed. An unlockable mode, Concentration Challenge, also follows the same principle. While these modes have a unique flavour, they don't offer much variety on the whole. While Devilish Training is the main attraction, Concentration Training also includes Supplemental Training, Brain Training, and Relaxation Mode. Supplemental offers exercises in line with what you'd find in the Devilish mode, except with a focus on setting a time-based high score, and without Devilish’s adaptive difficulty. However, I had the most fun in this mode with games like Word Attack (race to spell a word that flashes on the screen) and Sum Totaled: Battle (add the numbers that compose the bodies of attacking monsters). The Brain Training exercises are mostly less thrilling, composed of a few cards games and an odd piano simulator, but gems like Block Head manage to stand out. Relaxation Mode, as the name implies, provides simple fun with which to unwind. Some patience is required, however: the majority of exercises require a set amount of days trained to unlock. Within a week's time, most of the content is available, so as long as you're serious about your "training," it takes little time to access. Brain Age: Concentration Training provides a variety of new challenges , and allows players to choose how they train. With so much on offer, I never felt I had to take on challenges I did not prefer. The presentation is terrific, getting to what you want to do is kept simple, and Dr. Kawashima's comments and advice are concise and to the point. Overall, it's a well-rounded experience that works well as an educational tool, and makes a point to appeal to a player’s mindset by constantly offering rewards for a job well done. In fami-cast they mention street pass and passing up your scores , can you expand on that? Also this game would be great with spot pass and using 3ds friends to compare daily scores, does it do that ? It should . This would also be great with Facebook and twitter intergration for uploading daily scores . I really like the series but I'm not sure if polished presentation this has with voice acting and better graphics can justify a purchase without gameplay that's up to date standards. The infrastructure is ready it just seems that Nintendo doesn't want to take advantage of it and wants to rely on gimmick of devil which seems dumb idea. This game releases in 2012 in japan and 2013 elsewhere but I don't see the franchise really evolve as it can for modern times . So many other brain training games and aps and websites exist and this doesn't really seem to blow them out of the water just build on previous games which is not good enough any more. I purchased this game the day it came out and I have enjoyed it. Plus I've seen improvement in my abilities to focus at work and while playing basketball.